Yes. 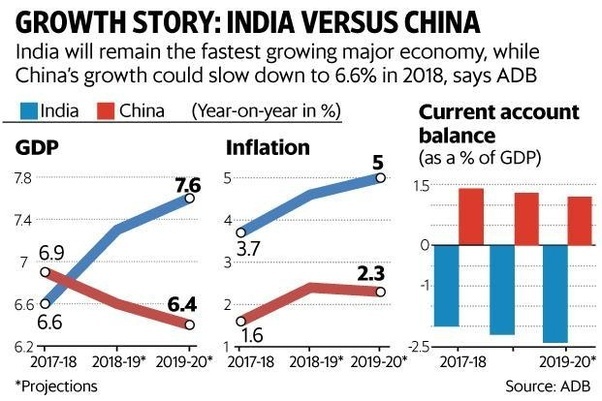 By most measures India would have more growth than China in 2019. Low base effect. India is still poorer and it is easier for a poor person to grow faster percentage wise. India still has some low hanging fruits to use, while China has used up most. China is going through a trade war with the US. At this point, India is not fighting anything with major powers. Overall, India doesn’t have many powerful enemies who will feel envious. In fact, India’s growth is not even noticed by most. Indian economy is less dependent on global trade that is going through a big toss with the biggest capitalist nation unsure. India is finally solving some of its basic problems that China tackled decades ago. That is putting a lot of tailwinds compensating for the global economy slowdown.